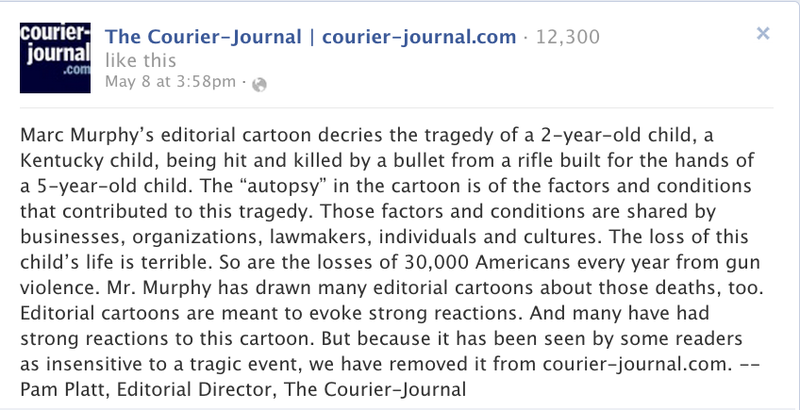 Media Critic | Are The Courier-Journal’s Opinion Pages So Liberal? Conservative critics of The Courier-Journal, I have confirmed all of your suspicions: its editorial pages are quite liberal. Setting its own editorial tone is the prerogative of every editorial page of every newspaper in the country. All of them, from the most liberal to the most conservative, have a perceptible editorial slant and make no bones about it. It’s not a secret that The Wall Street Journal’s editorial page is quite conservative, or that The New York Times’ editorial page is socially liberal, or that The Washington Post’s editorial page has been a reliable supporter of virtually every form of US war or military intervention since the beginning of the 21st century. But the editorial pages of newspapers are not supposed to be exclusive provinces of a single perspective. The WSJ asked Thomas Frank, of all people, to write a regular op-ed column for them. Conservatives like Ross Douthat write columns for the New York Times. Likewise, conservative voices can be found in the back pages of The C-J’s section A, but they’re outnumbered by the liberals. The dominant perspective on The C-J editorial pages—aside from The C-J’s own editorials, letters to the editor, and guest columns—is Marc Murphy’s. Murphy’s cartoons appeared 95 times in that five-month period, far more than any other syndicated columnist or cartoonist. In second place is former C-J cartoonist Nick Anderson, whose cartoons appeared 37 times in the same time period. On the January 1 editorial pages, The C-J ran a retrospective of Marc Murphy’s 2012 cartoons, then the next day ran a similar Nick Anderson retrospective. These cartoons were not counted in the total. Even though some daily newspapers no longer employ an in-house political cartoonist, many of them still do. The editorial boards at those organizations frequently use cartoonists who reflect their editorial perspective, so it is no surprise that The C-J relies heavily upon Murphy and Anderson. Despite that reliance, The C-J recently pulled one of Murphy’s cartoons from its website. 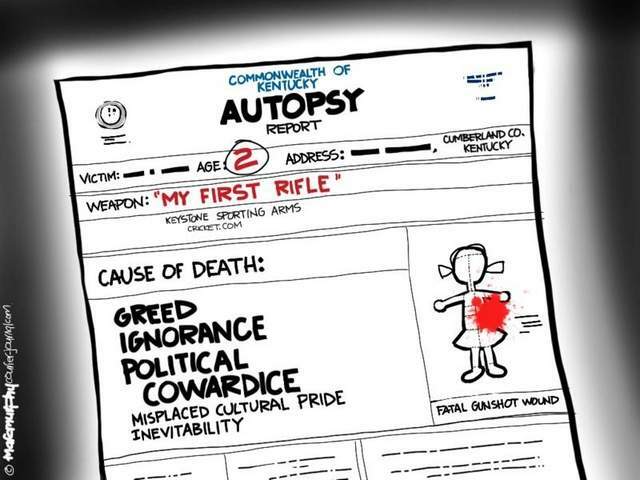 The cartoon, which depicted an autopsy report for the Cumberland County girl who had been shot by her brother with a .22 rifle marketed to young children, apparently outraged numerous readers. After pulling the cartoon, Pam Platt posted an explanation to the C-J’s Facebook page; in an email to me, she said that she wasn’t aware of any other times when The C-J had pulled a Murphy cartoon from the website. Now guess who is in third place after Murphy and Anderson with 24 appearances on The C-J editorial pages. Is it liberal columnist and Pulitzer Prize-winner Eugene Robinson? Could it be either The C-J’s own Pam Platt or Al Cross? Michael Moore? Ralph Nader? Karl Marx? No. It’s conservative cartoonist Lisa Benson. And in that same time period, The C-J published conservative columnist Kathleen Parker 17 times, former Bush speechwriter Michael Gerson 12 times, Fox News pundit Cal Thomas 10 times, and Washington Post’s conservative icon George Will 10 times. This is no accident; Platt told me that she “very intentionally” publishes these conservative voices. So while it is quite true that The C-J’s editorial page is heavily liberal, it is demonstrably false that the page is exclusively liberal. If you don’t count Marc Murphy’s nearly daily cartoons, conservative perspectives count for one-fourth of all syndicated contributions to the back pages of section A (or the entirety of section H on Sundays). In addition to its syndicated contributors, The C-J also publishes letters to the editors from a variety of perspectives (about which more later) and guest columns from local CEOs, politicians, presidents of charity organizations, and other newsmakers. Senators Mitch McConnell and Rand Paul, both Republicans, and Rep. John Yarmuth, a Democrat, have all been given editorial space to tout their records or defend themselves against attacks. The C-J also ran dozens of editorial features and commentary from McClatchy-Tribune News Service which were mostly one-offs written by non-journalists such as scientist Todd Sanford, parents Marc and Debra Tice, professor Gina Barreca, psychiatrist Harold Schwartz, and CEO John Masiz, to cite examples just from the first eight days of January 2013. As I said earlier, the Courier-Journal has the same right as any other news organization to adopt an editorial perspective of its choosing. Bill Lamb of WDRB has done an excellent job of this with his Point of View segments, where former C-J columnist John David Dyche found a new home. But this privilege of news organizations must be balanced with their obligation to provide a public forum—which the Courier does every day by printing letters from readers. Yes, conservatives, The C-J will print your letters, just as they will continue to publish George Will, Thomas Sowell, Kathleen Parker and Lisa Benson. But you really don’t have a leg to stand on when you demand that The C-J change its editorial content to suit your tastes. How would you react to liberals who made the same demand of 84 WHAS? You might tell them that (for example) Mandy Connell has every right to do whatever she wants with her radio show, and if liberals didn’t like it, then they should start their own radio stations. And you would be perfectly correct in that response. Now simply apply that logic to your own critiques of The C-J.